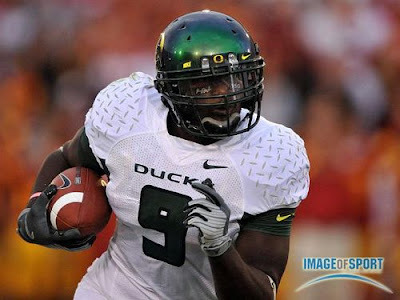 An Opinion On Sports: LaGarrette Blount: A Second Time Around..
LaGarrette Blount has been reinstated by Oregon head coach Chip Kelly for the remainder of the 2009 season. Kelly related that Blount has followed the plan of rehabilitation set up for him and he will be allowed to play this weekend against Arizona State. The Pac-10 had earlier approved Oregon's plan of reinstatement for Blount. He has missed a total of eight games during his suspension, and Kelly, along with Pac-10 commissioner Larry Scott, feels that he has paid a significant price for his actions, thus deserving a second chance. As you can view below, his actions were pretty deplorable, but I agree that he deserves a second chance. The earlier season long suspension virtually meant the senior running back was finished as a collegian, so perhaps this change of heart by Kelly will help Blount with his future. Here's hoping a lesson learned hard will be a lesson learned well. What's your opinion on LeGarrett Blount?